I had a great time presenting at Closing the Gap on October 10-11. 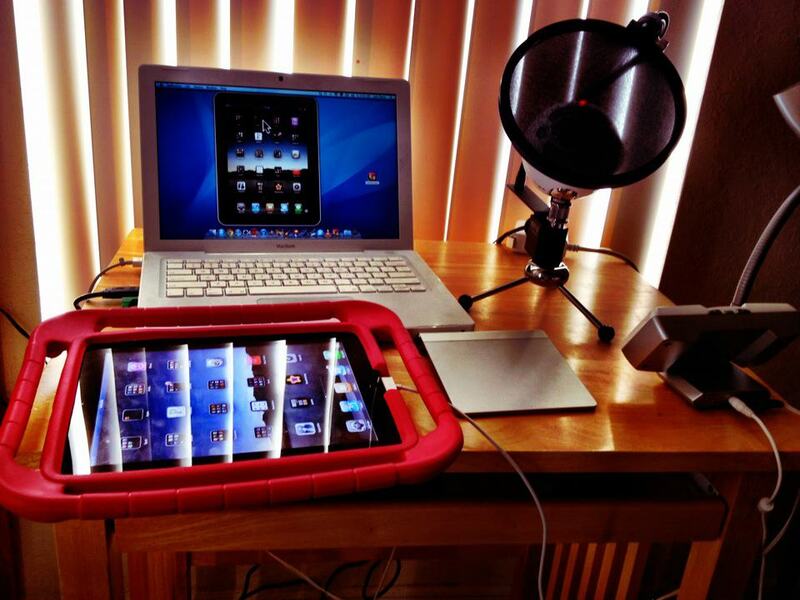 My first session was a two-hour block focused on content creation with the iPad (iCreate). I was joined by two superb co-presenters for this session, Eric Sailers (developer of ArtikPix and the upcoming LinguaPix) and Cathy Kingeter from AssistiveWare (makers of Proloquo2Go and Pictello). We had a great time showing off some of the content creation capabilities of the iPad for photography, and apps such as Pictello, Book Creator, iMovie and Explain Everything. My second session was an all ADE (Apple Distinguished Educator) affair. I co-presented with Mark Coppin and Mark Dohn, both of whom joined the program with me back in 2009. After the session, several people commented on the synergy between the three of us, which is not surprising given that we have presented together many times before. Our session was on adaptive photography (Photography for All). We showed a number of tips for improving photography in the classroom, along with some examples for how to use photography to engage all students and address core curriculum. 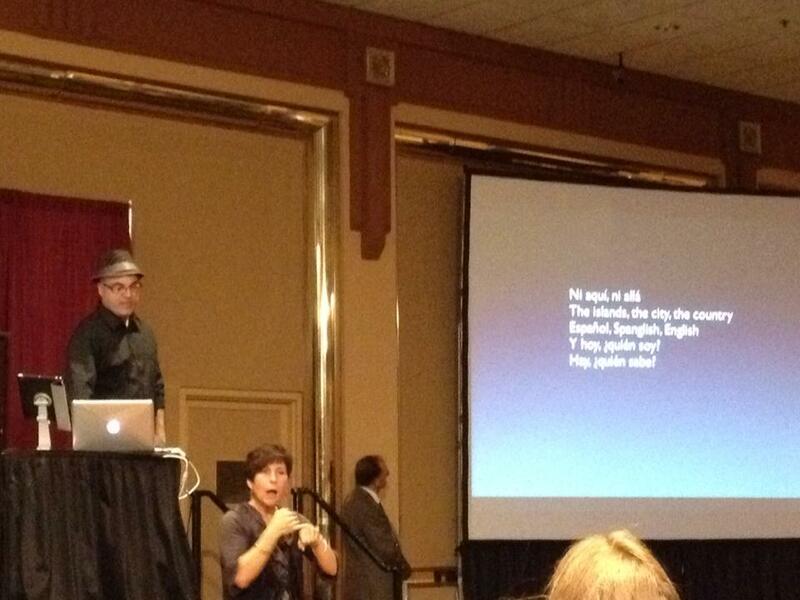 I presented a session on Apple accessibility at the State Convention of the Arc of North Carolina on October 4. This was my second time presenting for this group. 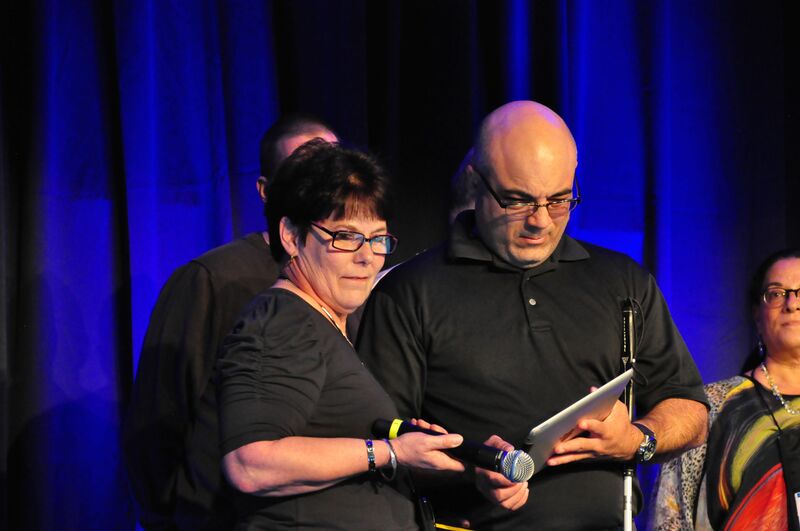 I had a great time showing off some of the new accessibility features in iOS 7. Too bad the leaves had not turned yet. It would have made for some really good photography. I had the pleasure of presenting with Kathy Wahlbin, of Interactive Accessibility, at the Boston Accessibility (Un)Conference on September 28. This was my first time attending this kind of conference, and I really liked the format. With the exception of a few sessions that were scheduled ahead of time, most of the program was determined the day of the event. I joined Kathy to demo some of the new accessibility features in iOS 7 to an audience of mostly web accessibility professionals. I wrote an article in the August/September issue of the Closing the Gap Solutions magazine that goes into more detail about the nABLE framework for selecting apps that transform educational practices for students with special needs. The framework is based on the SAMR model and Universal Design for Learning, and the article discusses these other frameworks as well as suggests apps and accessibility features for working at each level of the SAMR model (depending on the student’s need). Pérez, L., and Bryant, E. (2013). 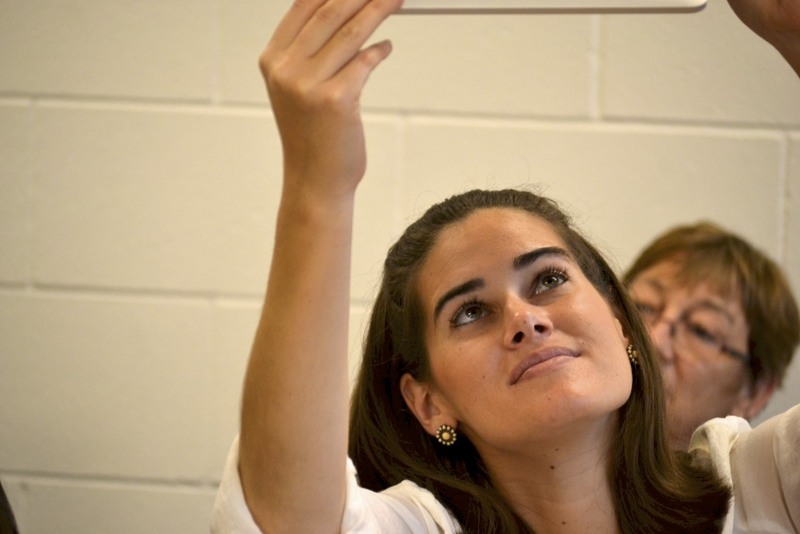 Mobile Learning for All: Accessibility Considerations for Mobile Pedagogy. In McConatha, D., Penny, C., Schugar, J. and Bolton, D., (Eds. ), Mobile Pedagogy and Perspectives on Teaching and Learning, Charlotte, NC: Information Age Publishing. I recently published an article in The Loop Magazine. This is a new magazine available through the Newsstand app on iOS devices. The article focuses on my experience with Apple technology and the difference these technologies have made in my own life. It also puts out a call to developers and content creators to start developing accessible apps and content so that the built-in accessibility features can work to their full potential. The title of the article is Magical Moments and you can read it for free online. A big thank you to Jim Dalrymple for featuring accessibility in his publication. In addition to my presentations, I participated in my first meeting as a board member for ISTE’s Special Education Technology Special Interest Group (SETSIG). SETSIG put on a great UDL playground for participants to explore mobile learning in the context of UDL. The videos shown during the playground are available on SETSIG’s YouTube channel. I highly recommend checking these out. 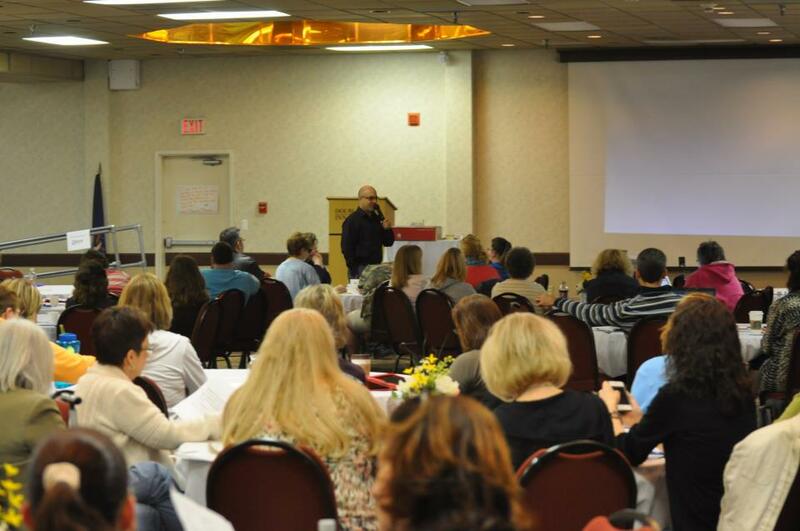 I was the opening keynote speaker at the 2013 PowerUp Assistive Technology Conference held in Columbia, Missouri. Along with the keynote entitled “InSights on Technology and Disability” I also did a breakout session on VoiceOver for iOS that was a lot of fun. 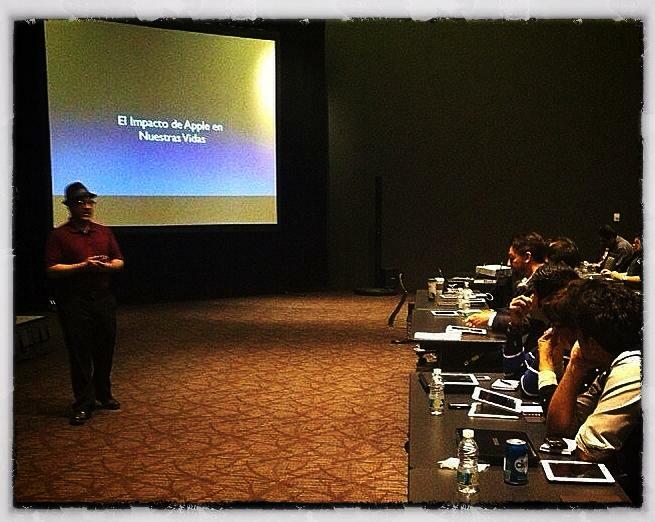 I had a great week presenting as part of Apple’s Learning Tour in Mexico. I presented two keynote sessions, one in Mexico City and one in Monterrey. 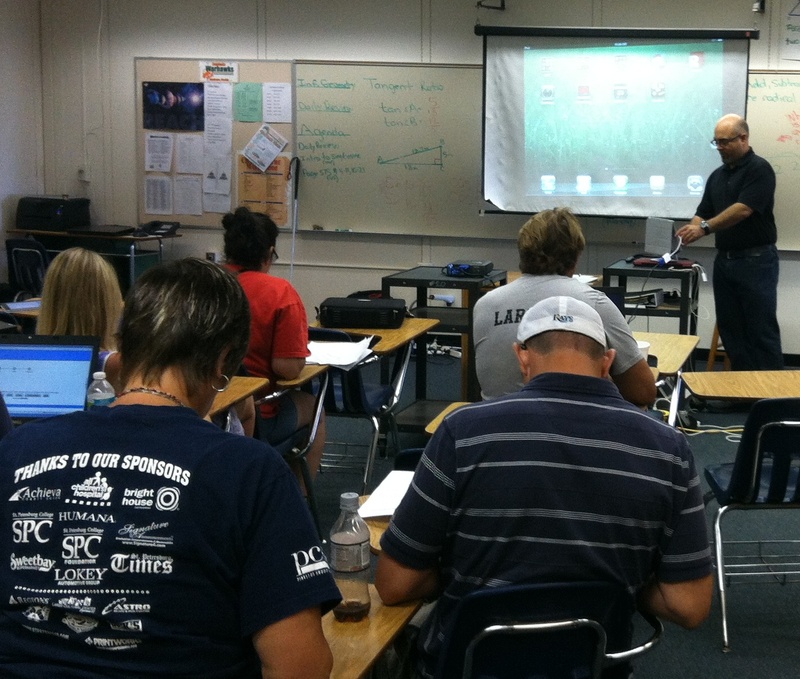 I also visited two schools where I presented sessions on iBooks Author to teachers. A big thanks to my ADE colleagues, the Apple Mexico staff, and the team at Soluciones Exa who were so kind to me by showing me around and taking good care of me while I was there. 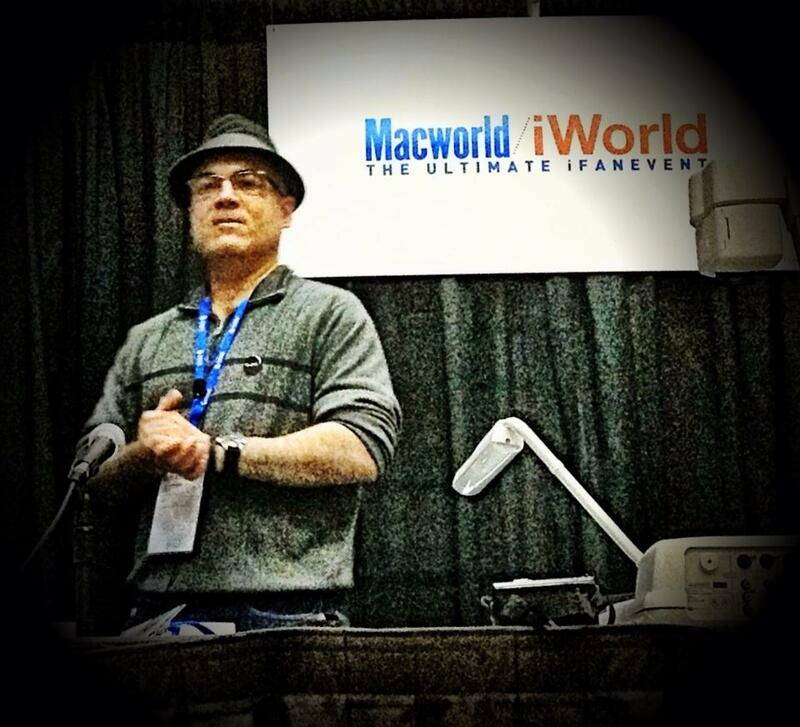 Right after FETC, I got on a plane to go to San Francisco to present as part of an ADE showcase at Macworld/iWorld. I was so fortunate to be invited to do a session on iBooks Author and the Future of Textbooks as part of this showcase, along with an incredibly talented group of ADEs. Inspired by one of the sessions I did at FETC 2013, I published an article in THE Journal focusing on tips and tricks every educator should know to get the most out of their iPad. I even snuck in a few accessibility features into the mix. I always love having a chance to share my love for accessibility and universal design with the broader educational technology community. Photography remains one of my favorite activities, even as my vision loss continues its progression. I know that even if I completely lose my vision, I will be able to continue with this hobby with the help of new accessibility features. To share my love of photography with other people who have vision impairments, I recently published an article in the National Federation of the Blind Future Reflections magazine. In addition to a session on UDL Implementation with iPad Apps, I also presented two 2-hour workshops at this year’s FETC in Orlando. I had been interested in the use of QR codes for a while, and what better way to learn more about them than to present a workshop! Along with my co-presenter and colleague Jennifer Hart, we had fun showing some cool uses of QR codes for adding digital resources to existing classroom materials. Our other session focused on the use of the iPad as a content creation tool. Along with apps such as Garageband, iMovie, Book Creator for iPad and Explain Everything we also shared some lesser known tips for getting the most out of the iPad (many of these tips involved using accessibility features, which should be no surprise given my interest in that topic). All in all, I thought it was a great FETC experience this year. I enjoyed that I was able to present on a range of topics and to a broader audience, while still incorporating information about accessibility where it was applicable. I did a presentation on November 15th for the Global Education Conference, an around-the-clock conference bringing together educators from all over the world to share best practices in education. My presentation focused on making iBooks textbooks for the iPad more accessible and a recording of it is now available (about 45 minutes). I co-authored (with Alex Dunn) an article focusing on the use of iPads and other emerging technologies as part of a UDL toolkit. The article appears in Teaching Exceptional Children+, the online version of the peer-reviewed journal of the Council for Exceptional Children. Dunn, A., and Pérez, L. (2012). Universal Design for Learning (UDL) in Action: The smart inclusion toolkit. Teaching Exceptional Children, 45(2). Available online at http://tecplus.org/articles. I was selected to speak as an Apple Distinguished Educator at Apple’s annual education sales meeting held in Austin, TX. My presentation focused on accessibility as a process that occurs on three waves: tools, content, and finally empowerment for people with disabilities. I was also able to show off some of my photos during my presentation. I attended the Closing the Gap conference for the first time and really enjoyed the quality of the presentations. I was busy doing a number of presentations myself: a full-day pre-conference workshop on iPad apps for content creation with students with special needs, followed by concurrent sessions on iBooks Accessibility and content creation apps (a condensed version of the full-day workshop). The sessions all went very well and I enjoyed working with my co-presenters, Cathy Kingeter from Origin Instruments and fellow ADE Mark Coppin (as well as Eric Sailers who was involved in the planning for two of the sessions but was not able to attend this year–get well soon, Eric!). I really enjoyed this conference and can’t wait to attend next year. I did a full day training hosted by the Center for Autism and Related Disabilities office in Jacksonville on September 27th. I had a great time showing off some of my favorite apps for modeling, social stories, visual schedules and curriculum support. I presented the opening keynote for the Kentucky Office of the Blind’s Annual AT Expo and Conference in Louisville on September 18th. My keynote focused on my experiences as a person who learned he was going to lose his vision as an adult, and how I use technology to help me do my work as a gradaute student with a visual impairment and to continue to enjoy my hobby of photography. Along with the keynote I also presented a breakout session on VoiceOver. On August 10th, I did a half-day training for the Florida Inclusion Network. The training was an introduction to the iPad and focused on basic iPad skills as well as tips and tricks for new iPad users. We also looked at some apps for visual schedules and for creating social stories for students with autism. The highlight of my summer was being selected to attend the Global Institute for the ADE program, which was held in Cork, Ireland. It is always great to get together with a group of educators who share the same passion for teaching and learning. I again worked within the Inclusive Design group to develop a course for iTunes U that will focus on accessibility. This course will be available soon and I will update this post with the link when it is ready. I had the honor of presenting a webinar for ISTE’s Special Education Technology Special Interest Group (SETSIG). This was a double-session and I had the pleasure of sharing presenting duties with Jane Farrall. My presentation focused on the built-in accessibility features of iOS 6, while Jane’s focused on switch access options for the iPad. A recording of our session is available. Allsopp, D., Colucci, K., Doone, E., Pérez, L., Hohlfeld, T., and Bryant, E. (2012). Interactive whiteboard technology for students with disabilities: A yearlong exploratory study. Journal of Special Education Technology, 27(4). King, K., Pérez, L., Sterner, D., and Bryant, E. (2013). Proactive solutions for accessibility in higher education: Meeting governmental policy and legal demands through universal design. In Ran, B. (Ed. ), Contemporary Perspectives on technological innovation, management and policy. Charlotte, NC: Information Age Publishing. I was invited to present day-long sessions on May 1-3 for the Signal Centers in Chattanooga, Tennessee. I really enjoyed visiting Chattanooga, and I am grateful to the Mak family for showing me around and providing me with an opportunity to take pictures of the city. The first day I focused on VoiceOver and other accessibility features for teachers who work with students with sensory disabilities. The afternoon sessions that day were the most fun: the teachers learned how to create a movie with iMovie for the iPad, and they also got an introduction to Challenge Based Learning. 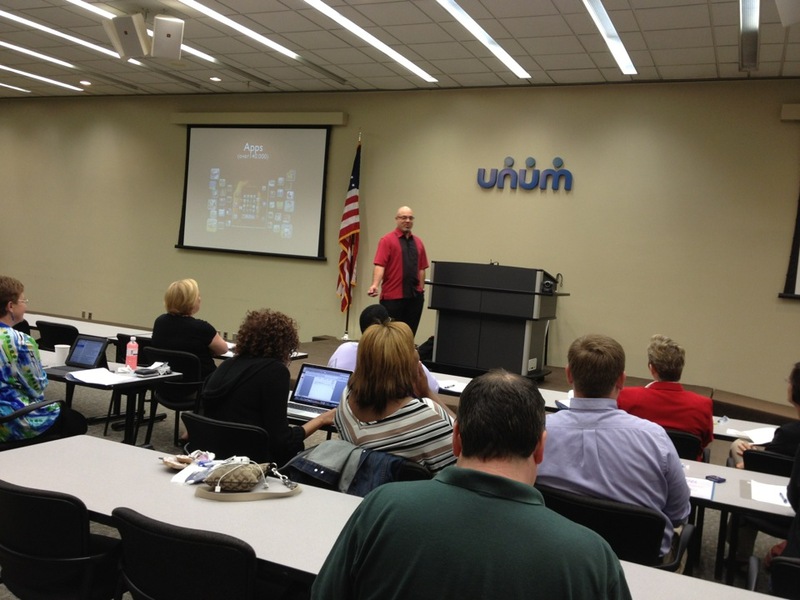 We were lucky to be working at a state of the art training facility at the Unum offices in downtown Chattanooga. 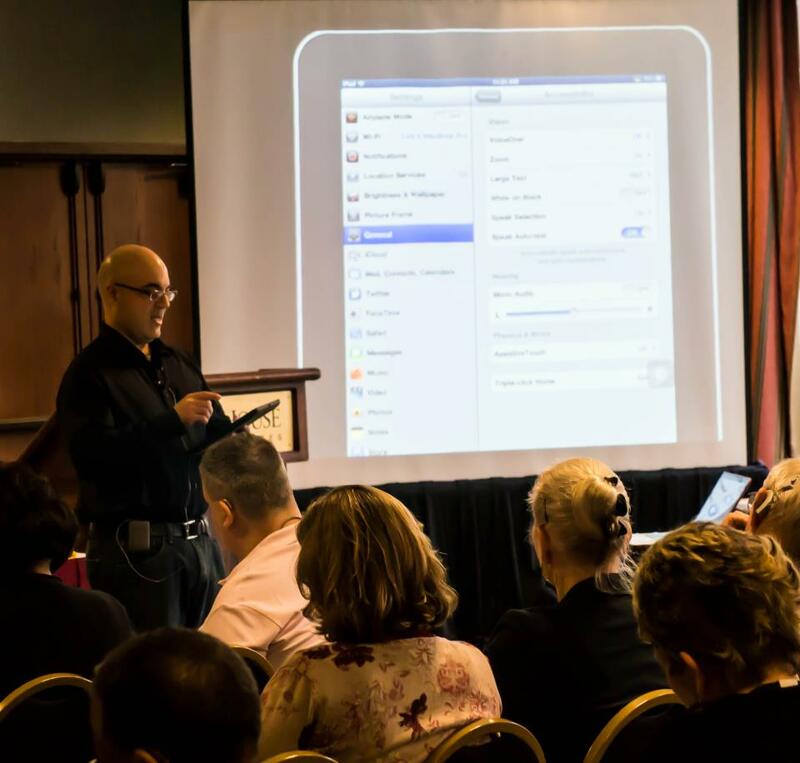 The second and third days I did full day sessions focusing on iBooks and publishing for the iPad and a wide selection of apps (from apps for social stories and children with autism, to apps that transform the iPad into a classroom response system). During my visit I even got a chance to see Bela Flek in concert with the Chattanooga Symphony Orchestra. This was one of my better work trips, and I hope I get to back to Chattanooga soon! On Monday, March 30th I presented a couple of sessions on accessibility for teachers in Pinellas County, not too far from where I live. These sessions were part of a district-wide professional development day for the county. In my sessions I focused on the accessibility features that are already available to teachers as part of the operating system (Windows, Mac and IOS – yes, I did a Windows presentation!). My hope is that teachers took away the idea that accessibility does not have to be expensive, because companies like Apple and Microsoft are building a lot of accessibility into their products so that a variety of students can use them right out of the box. On April 26-27, I presented a number of sessions related to accessibility at the 2012 Assistive Technology and Parental Involvement Conference hosted by the Ann Carlsen Center in Fargo, North Dakota.Our busy presentation schedule (I did five presentations in addition to a keynote to open the second day of the conference) was actually a lot of fun because I got to work with some of the top people in my field: my fellow ADEs Mark Dohn and Mark Coppin, and app developer/educational consultant Eric Sailers (creator of Artikpix). 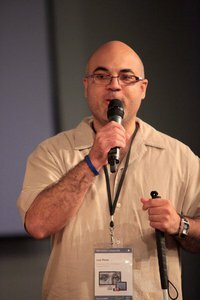 Below is a photo from my keynote, where I focused on my creative vision for people with disabilities and my life experiences as a person who has adapted to a number of challenges in life (from coming to the U.S. as non-English speaker, to my latest challenge living with vision loss). 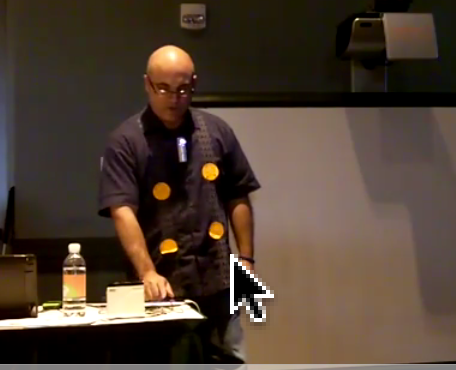 This was my first time presenting a keynote. My other sessions focused on IOS accessibility, VoiceOver, iBooks, iPad essentials, and Mac OS X and IOS support for people with low vision. I also participated in a fun app shoot-out to conclude the conference. Photo by ADE Mark Coppin. On March 24th, I had the pleasure of being one of the speakers at a meeting of the Foundation Fighting Blidness at the Moran Eye Center in Salt Lake City. The Foundation does a lot of work to raise funds for research that will lead to a cure for conditions like the one I have. You can learn more about their work at their website (www.blindness.org). For this presentation, I showed off some of my photos and talked about how Apple products allow me to pursue my creative vision as a photographer with a significant visual impairment. The session was even featured in the local media, with a nice picture of me presenting. Along with my of my Apple Distinguished Educators who work on mobile learning, I presented a remote session at the 2012 Mobile Learning Summit held at Hamilton College by the New York State Association for Computers and Technology in Education (NYSCATE). I love doing webinars because it means there is no travel. However there are always some technical challenges to overcome, such as poor Internet connections. For the most part my session went off with just a few issues and I was able to present most of my content before those occurred. This was the first time I presented by sharing my iPad screen to my Mac using an app called Reflection. It worked well, but sound appears to still be a problem for Airplay connections. Below is a picture of my setup before the session. I presented on the accessibility features of the iPad and apps for children with special needs. I was invited by Apple to do a full day training for teachers of students with visual disabilities in Wayne County, Michigan. This was a lot of fun for me because I got to focus on what I know best, apps and accessibility features for people like myself. We started off the morning by introducing the Apple approach to accessibility (built-in rather than added on) and I shared some of my personal history with accessibility. I then introduced the participants to the accessibility features for students with low vision and VoiceOver. After lunch we focused on more advanced features of VoiceOver (the rotor, the item chooser, entering text) and then we looked at several apps (MoneyReader, VizWiz and iBooks). 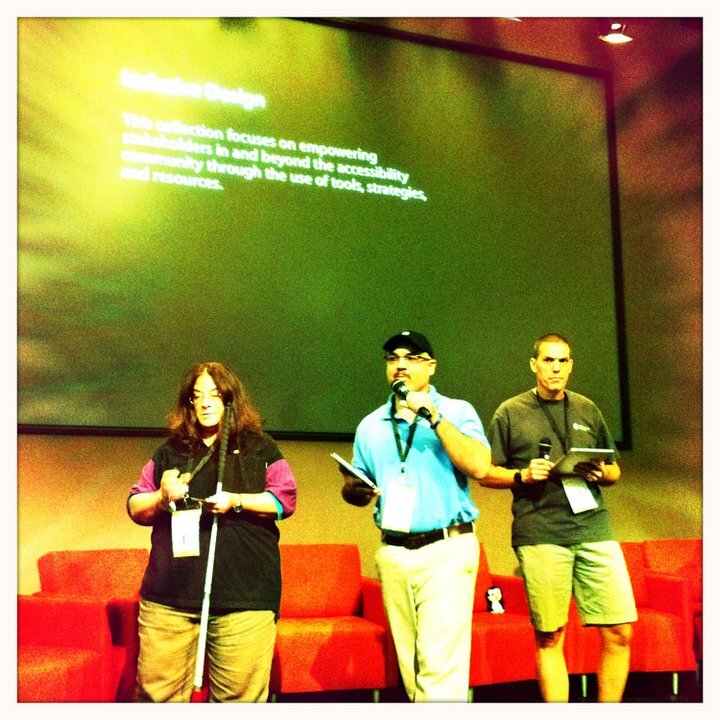 I presented a session on the accessibility of iBooks at the 27th Technology and People with Disabilities Conference (CSUN). My session took place during the first block of the conference (8 o’clock in the morning!) but it was well attended and there were a lot of questions that I did my best to answer. It’s always fun when you are presenting a new technology that has only been out for a few weeks. I always look forward to this conference. It brings together some of the giants in the accessibility community and this year was no exception. I met some amazing people who are doing a lot to improve access for people with disabilities. 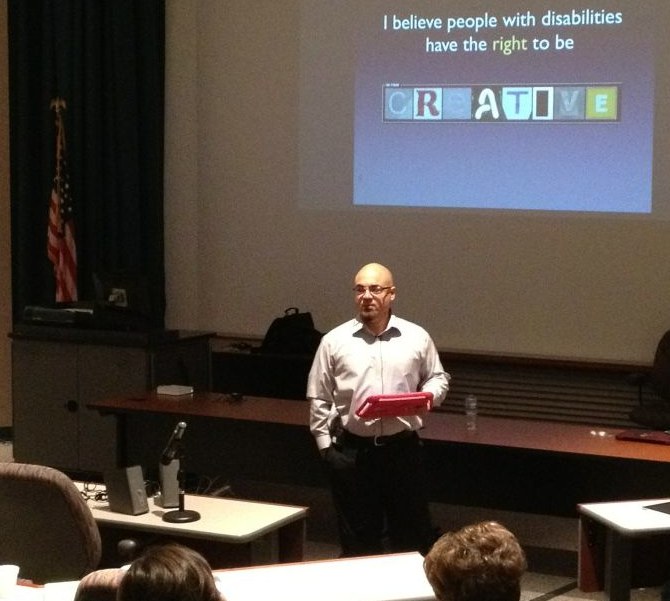 On February 14, 2012 I presented two sessions for Apple at the Annual Tennessee Special Education Conference. My sessions focused on the built-in accessibility features and popular apps for students with disabilities. I also shared some of my experience as a person with a disability and how I have been empowered by Apple technology to continue my work as a Ph.D. student and pursue my hobby as a photographer. I presented for Apple at this conference hosted by Lynn University, a private liberal arts university located in Boca Raton, Florida. As the name implies the Transitions Conference brings together experts who specialize in helping high school students with learning differences smoothly transition after high school to higher education. In keeping with the theme of the conference, I presented two sessions focusing on apps for high school and college students with learning differences. For the second year in a row, I did a presentation on the iPad in the special needs classroom at the Florida Educational Technology Conference (FETC). This was a general session focusing on the new features introduced in IOS 5 as well as updates to popular apps for special needs. The fun part of this presentation was losing power in the middle of it, but fortunately the lights came back on after a few minutes. Using my iPhone I was able to take a few pictures of the crowd before and during the short blackout. As you can see, the session was well attended. 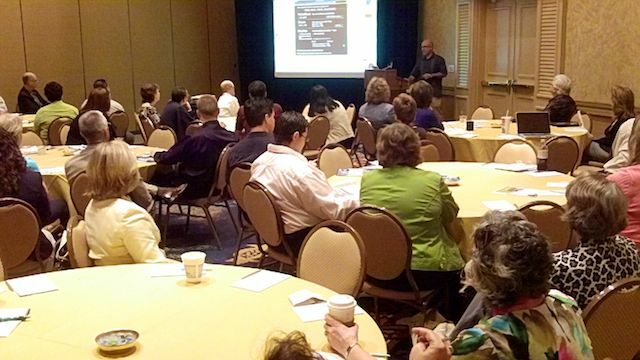 On Friday, January 13, 2012 I presented two sessions for Apple at the 19th Annual Conference on Autism sponsored by the Centers for Autism and Related Disabilities (CARD) of Florida. 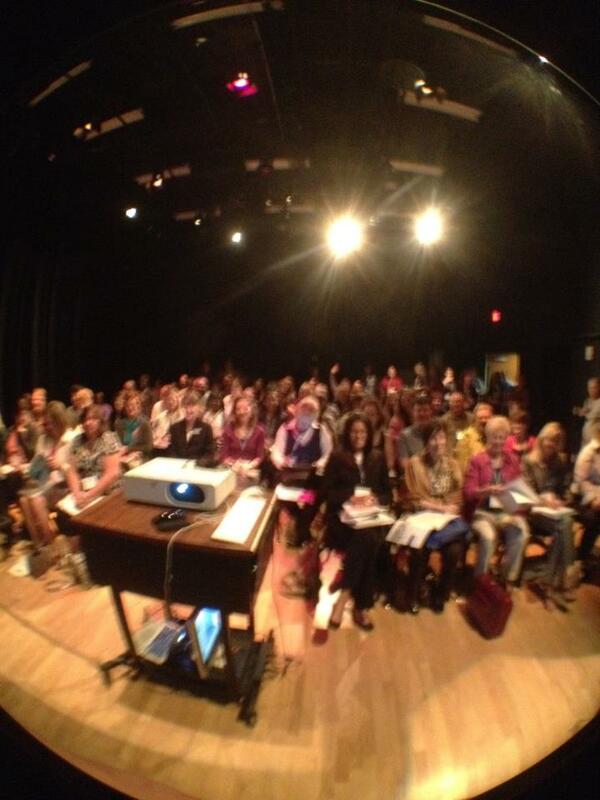 My sessions were part of the pre-conference educator’s day. After providing a high level overview of the built-in accessibility features of the iPad, I then demoed a number of apps that can benefit children with autism and related disabilities, such as Proloquo2Go, iCommunicate, and Verbally. I was honored to present at an Apple pre-conference workshop for the Florida Department of Education Administrators’ Management Meeting. The Florida Department of Education, Bureau of Exceptional Education and Student Services holds this annual event for district-level Exceptional Student Education directors and managers in Florida to discuss issues, policies, and procedures affecting Florida’s schools. The pre-conference workshop focused on the iPad and its accessibility features. My part of the presentation focused on apps for special needs, including apps for communication and visual impairments. SPARC is a regional conference for parents and service providers that is held in Pinellas County, FL each year. This was my first time attending, and my presentation focused on the resources available on the Tech Ease 4 All website I developed at the University of South Florida. Along with sharing some of the lessons I learned in developing the content for the site while trying to stay true to the philosophy of Universal Design for Learning (UDL), I was able to also demo some of the assistive technologies featured on the site. I was one of the speakers at the state convention of the Arc of North Carolina. I believe my presentation was the only one that focused on technology, and I had a full house. My presentation focused on the whole range of Apple accessibility solutions, ranging from Apple computers to mobile devices. I did a demo of VoiceOver as well as at least one feature from each tab in the Universal Access section of System Preferences. Along the way, I also showed off a few apps on the iPad along with the built-in accessibility features. The Arc was great to bring me to Concord, NC, the site of the conference, and I enjoyed meeting people from another area of the disability field (my focus is primarily on visual disabilities). I was invited by Apple to do a full day of training for the special education department at Florida International University in Miami. It was great to work with an enthusiastic group of educators in my own field. The teachers had each received their own iPads, so they were pretty excited to learn how to use it. We started the day with an overview of the iPad’s key features (multi-tasking, folders, etc.) and some essential apps, followed by a review of apps for different curriculum areas. In the afternoon, I focused on the accessibility features of the iPad and demos of different apps for special needs. I joined Apple staff for a full day of training that was part of the Summer Institute on Autism hosted by the Partnership for Effective Programs for Students with Autism (PEPSA). The training focused on the use of iPads to meet the needs of students with disabilities, and it included teachers from Hillsborough, Pasco and Pinellas counties (FL). We did the training in four sessions, each with about 30 teachers. It was a lot of fun because there were iPads on hand for all the teachers, and they really had a good opportunity to try out a number of apps that would benefit their students during the school year. For the third year in a row, I was chosen to attend the ADE Summer Institute. This time it was held in Phoenix, AZ rather than in Orlando at Full Sail University. Boy, was it hot! I was part of a team focused on inclusive design and accessibility. I loved my team and over the last few months we have been working on a collection of resources for the new ADEs on iTunes U site that is going to rock! I love that our assets are closed captioned, showing that we are willing to walk the walk and not just talk the talk when it comes to accessibility. I will update this page when the collection is publicly available. Photo by ADE Les Simpson. I was invited to present at an in-service day for teachers at Gulfside Elementary in Pasco County. 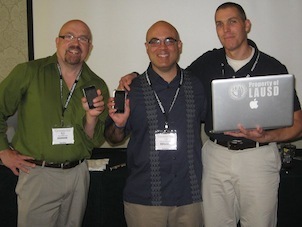 I did two presentations on Apple products, one in the morning on Keynote, and one in the afternoon on iMovie. Both were hands on workshops and I think the teachers were really happy that they actually ended up with a decent product at the end of each workshop. I do most of my work with pre-service teachers at USF, so it was great to get a chance to spend a day out in the schools. Gulfside Elementary has a great technology specialist in our iTeach mentor Jennifer Hart, and I was also happy to see that their principal attended the training and was really involved with what is going on at the school with technology. Jennifer did a great job of organizing the day, and I liked how she set up a number of rotations to allow the teachers to learn about a number of technologies, including iPads and iPod nanos. Pasco County Media Services put together this brief video about the day. I had the pleasure of visiting Apple’s Cupertino headquarters to record a webcast on the accessibility of Apple products. I had a lot of fun recording the webcast, which had about 600 people logged in at one point. My segment was about 15 minutes in length and focused on the need for accessibility, our efforts to include accessibility at USF, and the accessibility features built into Apple’s devices that have made such a difference in my life. A recording of the webcast is now available. I had a very busy CSUN 2011 this year. To start things off, I co-presented a pre-conference workshop entitled The iPad in the Special Needs Classroom with my two favorite ADEs, Mark Dohn and Mark Coppin (pictured). This was a fast paced presentation where we made a case for the use of the iPad with students who have special needs, demoed the buiilt-in accessibility features in IOS, and shared a number of apps. On Thursday, I began the day by doing a demo of MagniLink iMax, new screen magnification software for Mac low vision users developed by David Niemeijer of AssistiveWare (creators of Proloquo2Go) Next, I was honored to be invited by Apple to do a demo of VoiceOver at their presentation on Snow Leopard. To end the day, Mark Coppin and I did a session on the authoring of ePub documents for the iPad. We showed participants the step-by-step process for authoring their own ePub documents with Pages on the Mac, as well as how to make sure those documents are accessible with VoiceOver. Below are links to our slides from the pre-conference workshop and the ePub presentation. I had a great time at CSUN 2011 and I can’t wait for next year. I have never been much of a runner, but I set a goal to complete my first 5K this spring. This goal was acommplished at the 2011 Gasparilla Distance Classic. I came in 2 minutes under my goal after only about a month or so of training. 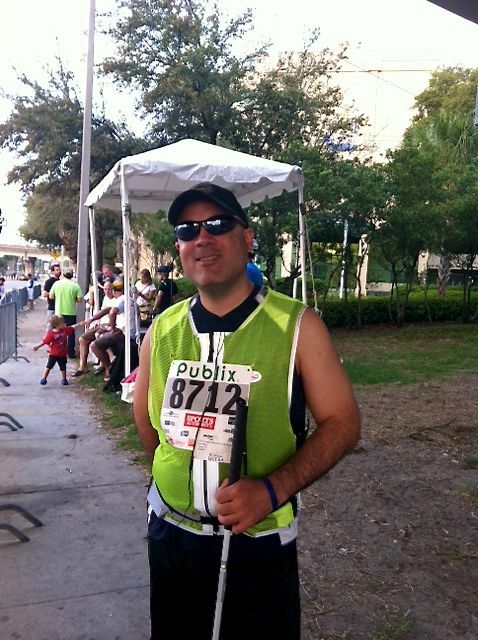 I hope to continue running and participating in 5K races in the future. It was a challenge running with so many people, but my guide did a great job of keeping me out of trouble. Here are a few pictures from that awesome day. I was the Apple presenter at a train the trainer meeting of the Texas Department of Assistive and Rehabilitative Services (DARS) on February 14th. I presented to about 100 trainers who work with people with visual disabilities who are clients of DARS around the state of Texas. 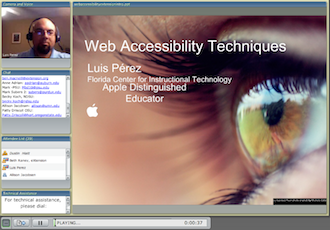 My presentation focused on VoiceOver and other low vision aids built into Mac OS X and IOS. It was a great experience to present to this group, because I have been a client of the Division of Blind Services here in Florida and I know what a difference these trainers will make in the lives of people with disabilities. 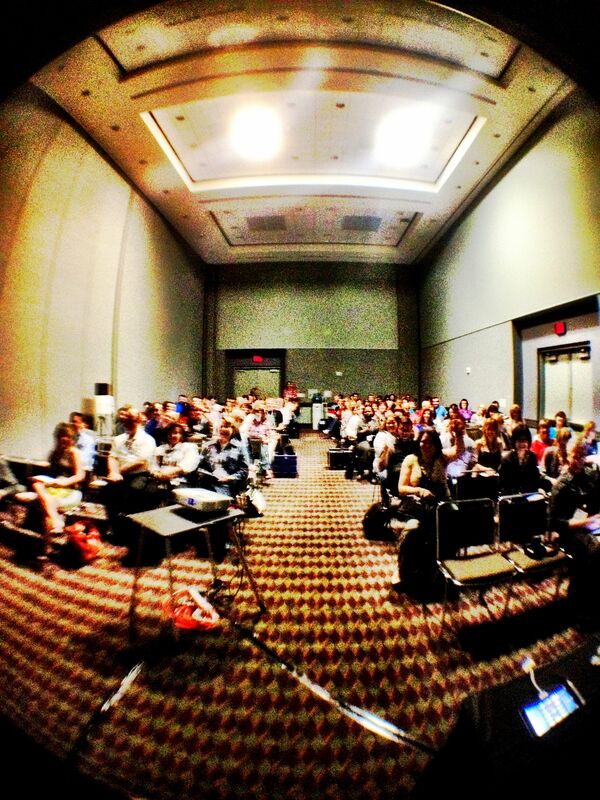 I did two presentations at FETC 2011. The first one was a standing room only presentation on the iPad and iPod touch in the special needs classroom. With my co-presenter, Ezzard “BJ” Bryant, I showed off new accessibility features in IOS 4.2 for Apple mobile devices, along with several apps that can benefit students with special needs. I have posted a brief video from my demo on my YouTube channel. For my second presentation, I covered the process and lessons learned from developing an accessible technology training site, Tech Ease 4 All. I co-presented a session entitled “Empowering People with Disabilities: Apple Accessibility Solutions” at the National Convention of the Arc in Orlando on November 4th. The Arc is the largest community-based organization advocating for and serving people with intellectual and developmental disabilities. My presentation focused on the Universal Access features built into OS X as well as the accessibility features available on the iPad (VoiceOver, zoom, white on black, etc.). Even though the presentation was the first concurrent session of the convention, attendance was very good. I was fortunate to be invited to the 2010 Apple Distinguished Educators Summer Institute held July 11-16 at Full Sail University in Orlando, Florida. Throughout the week of this institute, I worked with a group of four talented educators who are dedicated to using Apple technologies to improve the lives of students with special needs. For our final project, we created a wiki where we hope to collect testimonials of the impact of Apple technologies on the lives of these students. I am proud to report that our videos were the only ones that were closed captioned, a testament to our commitment to accessibility. I captioned the videos using MovCaptioner, a program for captioning QuickTime movies on the Mac.. If you would like to contribute your own story, please visit our wiki. I did two presentations at the 25th Annual International Technology & Persons with Disabilities Conference (CSUN) held March 22-27th in San Diego California. My first presentation was a 3-hour workshop entitled “The iPod Touch in the Special Needs Classroom.” Along with fellow Apple Distinguished Educators Mark Coppin and Mark Dohn, I demonstrated the built-in accessibility features of the iPhone/iPod touch (the iPad had not been announced yet), as well as apps that can benefit students with disabilities. The second presentation was a 1-hr session on the accessibility features of Mac OS X. This past winter, I presented two webinars for eXtension, a national initiative that provides online professional development for faculty and staff at land grant universities. On December 17th, 2009, I presented “An Introduction to Web Accessibility.” The goal of that session was to provide an overview of the benefits of web accessibility (the “why”). 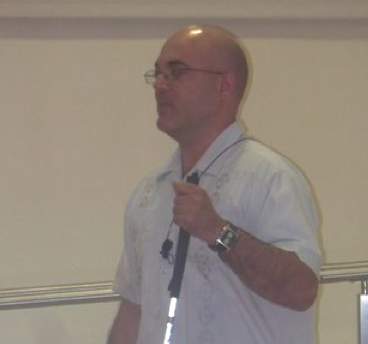 On January 12, 2010 I did a follow up session entitled “Web Accessibility Techniques” where I demonstrated several free tools for checking the accessibility of any website. The webinars are archived at the eXtension Professional Development wiki. Accessi-BULL is a yearly event held at the University of South Florida to raise awareness about disability issues on campus. For Accessi-BULL 2009 I presented a 20 minute “Introduction to Web Accessibility” focusing on five easy tips for making a website accessible. 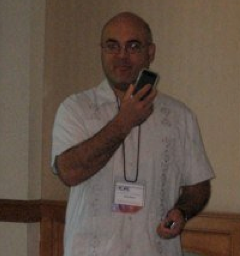 I did back to back presentations on podcasting for geography education at the 2009 conference of the National Council for Geography Education. In addition to the beautiful setting for the conference (San Juan, Puerto Rico), I enjoyed having an opportunity to present technical content in Spanish. My other presentation at this conference focused on GeoRSS and its application to the teaching of geography.